COLUMBUS, Ind. - Toyota Material Handling, U.S.A, Inc. (TMHU) has expanded its award-winning 8-Series lift truck line with the introduction of a new 3,000 to 6,500 lb. capacity diesel series powered by a clean-burning Toyota engine. The 8-Series small capacity lift trucks offer significant advancements in durability, ergonomics, productivity and fuel efficiency, while meeting stringent federal EPA Tier 4 Final diesel engine standards. The newest lift trucks expand Toyota's comprehensive diesel pneumatic line, which now provides 3,000 to 17,500 lb. capacity models that meet the federal EPA Tier 4 Final regulations. "Toyota's new small capacity diesel lift trucks reflect new innovations in product design and fuel efficiency and take lift truck productivity to a whole new level," said Jeff Rufener, president of TMHU. "Our customers can expect a quality lift truck that exceeds the performance demands of tough workplace environments with the added benefit of achieving up to 25 percent greater fuel efficiency over previous models." Powering the small capacity 8-Series line is the powerful 1ZS engine-designed for industrial operation and built by Toyota Industries Corporation (TICO), manufacturer of more than 15 million engines to date. The new 1.8-liter, 3-cylinder engine features the latest electronic fuel injection system with Controller Area Network (CAN-BUS) technology to deliver substantial improvements over the previous 4-cylinder engine it replaces. Thanks to new engineering advancements, Toyota's 8-Series engine maintains the horsepower and increases the torque, as the previous engine, while achieving greater fuel savings. To meet today's emissions requirements, the 1ZS electronic common rail fuel injection system works in conjunction with an intercooled, variable nozzle turbocharger and a Diesel Oxidation Catalyst (DOC), minimizing emissions and particulate matter to levels, meeting the Tier 4 Final emissions standards. The result of these advancements equates to less downtime, lower costs and increased productivity compared to other solutions in use today, such as Diesel Particulate Filters (DPF). New Load Sensing Power Steering - Provides steering assistance only when needed, reducing demand on the engine and hydraulic system, while increasing fuel efficiency. 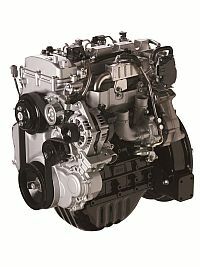 Combined with the new 1ZS engine, it provides up to a 25 percent fuel savings over the previous engine. Automatic Idle-up System (1) - Allows feathering of the hydraulic lift lever under the loaded condition for fast, efficient and smooth load handling. 'Eco" Mode (2) - An Economy or "Eco" Mode to help improve truck fuel efficiency over the course of the work day with minimum power reduction by optimizing the performance curve of the engine to work conditions. Auto Engine off(2) - A programmable Auto Engine Off feature that automatically powers down the lift truck after a user programmable preset amount of time to save both fuel and unnecessary wear and tear on the engine. Emphasis on improving reliability and maximizing uptime was a key focus in the design of the new 8-Series diesel models. The chassis features fully-stamped steel plate side panel construction and a significant reduction in cosmetic sheet metal and plastic. Critical controllers and relays are protected in a sealed box and new water-resistant connectors help guard against damage when working in adverse weather conditions or in corrosive applications. Rear combination lights are mounted high on the overhead guard for improved protection, and long-life LED lighting is available for added reliability. In addition, to help protect the engine against heat damage, the 8-Series small capacity diesel line offers a standard engine protection system that automatically reduces the 1Z engine's output if the coolant temperature rises to potentially damaging levels. Operator comfort was a top priority in the design of the 8-Series small capacity lift truck line. Ergonomic improvements have been made to the floor space, entry step, a curvilinear overhead guard post shape and a smaller diameter steering wheel-all developed to enhance operator comfort. Features like the new, 12-inch long dual operator assist grips provide an easy-to-grip hand hold for stability and make this one of the easiest lift trucks to enter and exit from in its class. In addition, optional electronic mini-lever hydraulic controls are easy to use along with a three-way adjustable armrest to enhance operator comfort. A variety of features work together to provide optimal visibility to provide better performance and productivity for the operator. Dash-mounted digital displays combined with the low-profile cowl with sloped dashboard provide an unobstructed view of the forktips in any position. Strategic placement of the overhead guard bars provide ideal visibility when positioning forks and handling loads placed high on racking. A wide-view rear overhead guard opening with high mount rear lights integrated into the overhead guard and low profile LPG tank placement help provide operators the view they require when driving in reverse. In addition, a new improved headlight is available, providing greater visibility for the operator. The 8-Series small capacity lift trucks offer Toyota's exclusive System of Active Stability™ (SAS), which helps reduce the likelihood of lateral and longitudinal tipovers. When the SAS system detects instability, its advanced sensors simultaneously signal and engage the appropriate controller. The Active Control Rear Stabilizer System and the Active Mast Function Controller System work in conjunction to add truck stability and help reduce the likelihood of a lateral overturn and decrease the chance of spilling a load or tipping the lift truck forward or backward. Additionally, for added operator safety, a technician- programmable vehicle travel speed control system has been incorporated as standard equipment, which helps regulate the lift truck's maximum travel speed to ensure proper speeds are maintained in the facility. The new lift trucks will be manufactured at Toyota Industrial Equipment Mfg., Inc. (TIEM), in Columbus, Ind., with orders currently being accepted.